CALL 210-405-1276 TODAY TO LEARN MORE! At a well-attended annual HOA meeting in February, developer-representative Kim Woodbury introduced a proposed new Amenity Center to be located along the western edge of the community. 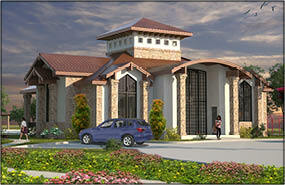 The facility would include a pool, multi-purpose/function room for community gatherings, card games, event rentals, etc. and much more. A survey was sent out earlier this month asking residents to provide feedback on desired features to be included. If you did not receive the survey request, follow the link here. SouthStar will be hosting a Town Hall Meeting in April to report results back from the survey, present the updated plan and proposed costs to operate the facility. The current homeowners will need to vote to change the existing covenants to the community to allow the change in annual assessments required to ensure the new facility is able to operate consistently. More information on a date and time for that meeting will be coming via email, mail and NextDoor. Above is an artist’s rendering and is subject to change without notice. The city of San Antonio is underway making some improvements to Jim Mattox Park. These will include installing a pavilion, a shade canopy over the playground, completing the oval walk in the middle of the park, and installing a pad for a portable toilet enclosure. The city is also looking at the tennis courts to see what they can do to resolve the standing water issue, if time and resources allow. All is expected to be completed by April for your enjoyment. 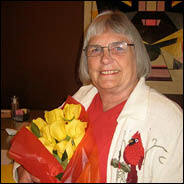 We wanted to say a warm thank you to Virginia Rogers for her service to Mission del Lago. Effective this month, Virginia is stepping down from the HOA Board and from her long-held leadership & management roles within the community. Virginia has been a dedicated member of the former development team and day-to-day management of Mission del Lago since its inception. Thank you for your time and service and best wishes to you in the future! Sales at both Lennar and DR Horton are at all-time highs for the community. Clearly many are discovering what is so special about Mission del Lago. And now, DR Horton is introducing a new line of homes at Mission del Lago, Express Homes. Replacing their current line of homes, the Express Homes are existing homes that buyers will be able to walk through and purchase, allowing residents to move in even sooner. The Express line is one of the most successful collections of floorplans ever presented by DR Horton, featuring 3-5 bedrooms from the $140s. View the 7 new floorplans expected to be available in May here. Mow, edge and trim your yard on a regular basis. Be sure to include edging along all driveways, sidewalks and curbs and dispose of your clippings. Pick up litter you notice in the community and dispose of it. Make sure household trash is bagged, secured and disposed of. Make sure your portable basketball goal is stored out of sight when not in use. Thank you to the many of you who have paid your annual assessment promptly. For those outstanding, please pay promptly via the REALMANAGE tab on mdlhoa.org. RealManage and their legal team have been actively working with owners on payment plans and finding ways to resolve outstanding assessments and fines. Call us at (866) 473-2573 or email us with any questions. The extension of the beautiful Medina River Trail that will connect it to Mission del Lago is well underway and is expected to be completed late this year. 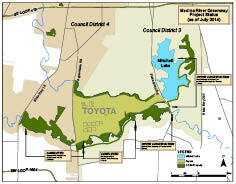 This 6-mile trail addition will start at the Mission del Lago Golf Clubhouse and join the current 7.3 mile Medina River Trail south of the Toyota Plant. This trail is enjoyed by thousands of people every year, what a great way to introduce new families to Mission del Lago and the beauty of the SouthSide! We will continue to keep you posted. Thad oversees all community development in Texas. Located at the company’s headquarters in Austin, Thad has a passion for the growth and culture of Texas. A seasoned land planner for nearly 30 years, Jim will be overseeing the day-to-day planning and development at Mission del Lago. Laura oversees all property management for SouthStar Communities. She works with Real Manage to ensure we are on task regarding notices of violations, architectural approvals, association budgets and more. Laura’s 20+ years in property management bring a wealth of efficiency and success. Laura will be assuming the role of Vice President of the HOA Board effective this month. Following a list makes everything in life easier and more efficient. Here are some spring cleaning tips and techniques for every room in your home. Dust and vacuum corners and crevices from high points to low. Remember dust falls downward so you want to clean from the top to the bottom of any room. Vacuum furniture, lampshades and pictures. Remember all those gadgets that come with your vacuum cleaner? Use them here, and experiment with different attachments for furniture and corners of rooms. Take plants outside for a gentle washing with a fine spray from your garden hose. Plants and their pots get dusty over the winter. Take blinds outside and wash them with a mild ammonia solution Rinse with that good old stand by—the garden hose! Strip bed linens and dust ruffle. Vacuum your mattress and box spring. Flip and rotate the mattress before putting on new sheets. This will prevent dips from forming on the mattress, and keep it firmer longer. Polish wood furniture and dust knickknacks. Vacuum everything, from the floor behind and under the bed to the carpet, lampshade and pictures. Clean mirrors and wipe down light fixtures and lamps. Let cleansers do the scrubbing for you! Spray your oven with cleaner the night before you plan to spring clean your kitchen This will literally “marinate” the grease and grime, making it simple to sponge off. Vacuum stove vents, refrigerator coils, floor, and counters. Defrost that freezer. A blow-drier aimed at the ice will speed up the process. Get rid of old foods, or those jars of things you thought you’d like but never ate. Clean the inside of freezer and fridge with a solution of three tablespoons of baking soda and one quart of warm water. Clean outside of fridge with glass cleaner. Wash out the trash can and spray it with a good disinfectant before putting in a new lining. Leave it outside the kitchen for the next step. Spray shower and tub with strong cleanser. Pour cleaner into the toilet bowl, and spray the outside with the same cleaner. Let the chemicals do the cleaning while you do the next steps. Clean mirrors, chrome, bathroom scale, and light fixtures with glass cleaner. Vacuum everything! This will remove dust and hair that is so hard to get up when surfaces are wet. Empty and clean the wastepaper basket. Clean the sink and wipe off the cleanser you already applied to the shower and tub. Working from the top of the toilet down, clean the outside, and brush and flush the inside. Have a question about the Mission del Lago community in general, homes for sale, events going on, or just want to say “Hi?” There are a number of ways you can reach us: • By phone at 1-800-835-0197 • On the Internet • By email Don’t forget to check out our blog for news and information on community events. Have a Homeowner’s Association Inquiry? Call 1-866-473-2573 or send an email. Click here to follow us on Facebook. Refer Your Friends, Get a Gift! Wouldn’t you love to turn your friends into neighbors? When you do, it pays off in more ways than one. With Mission del Lago’s special homeowner referral, you’ll get one year’s HOA dues paid when your referred guest closes on a new Lennar or DR Horton home in the community. Contact Us Now For Availability & Pricing!